Welcome to Royal West Drywall, Inc.
We strive to provide our customers with the very best in quality. We place responsible and knowledgeable personnel on our job sites to ensure your installation is the very best in the industry. We monitor and do quality control on all our work daily, from start to finish. We have foreman who are competent to follow job specifications so that all projects are completed on schedule. 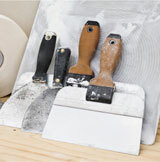 Choose one contractor for your painting and drywall needs.